The following transcription of the conversation was published in PANOPTYKON, 2005. I'd like to welcome everyone and introduce Monika Weiss, Polish artist who lives and works in New York City. Today's presentation marks the first stage of our collaboration. Among others Monika’s installation will be part of the exhibition You Won't Feel A Thing at the Kunstlerhaus Bethanien in Berlin as part of the Polish Year in Germany. 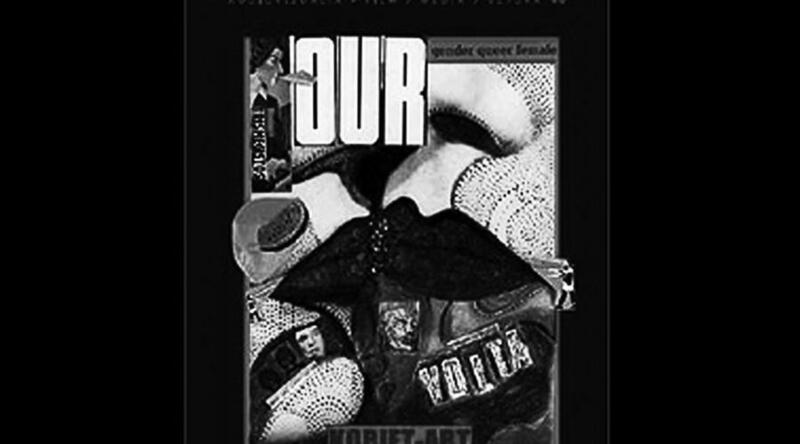 The theme of the exhibition is the motif of rituality and obsessiveness in art. I was very interested in presenting Monika's video works, which are documents of performances but also function as independent works. 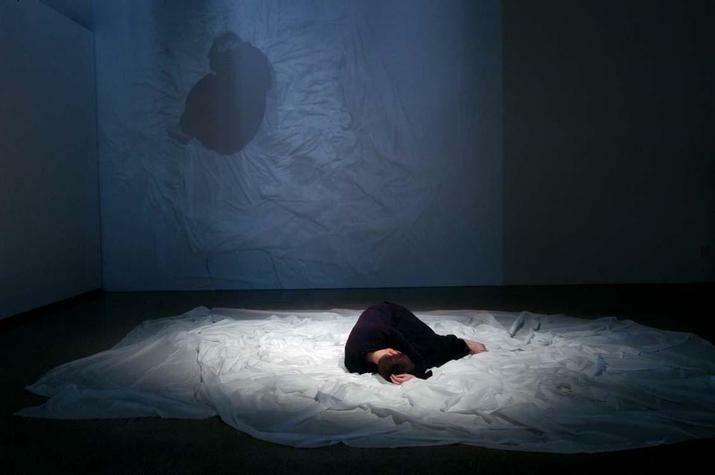 Monika’s art merges traditional forms of artistic expression such as drawing with installation, video, and performance. 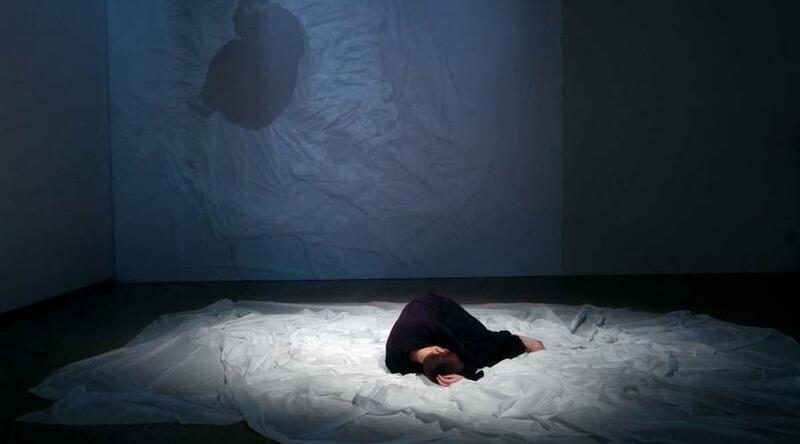 Her intermedia work investigates the relationship between the space and the artist's body. There are reoccurring motifs in your work, which interest me as curator. Such recognizable form is your own body, often in a curled-up, embryo-like position, which also appears in your drawings. Can you tell us more about that motif in your work? Curled-up position signifies vulnerability but also becoming, the state between being and non-being. The boundary between presence and absence is very fluid. A frequent motif in your work is the act of drawing around one's body, mapping the territory. You repeat your movements in an almost obsessive manner but also ritualistic. Your actions take long time, often many hours or even days. It is a kind of a state of body and mind. What is your relationship with the outside world when you perform? During my actions my eyes are closed, I sometimes draw with both hands simultaneously, questioning the control of the eye and of the singular hand. I am in a state of maximal concentration. I experience a need to see or create an image, which becomes gradually visible through the lens of the suspended camera. The sound becomes louder, as if cutting through my body. To a certain degree that physicality of sound inspired me to impose on people a demand of silence. Silence allows for maximal focus, we become aware of the presence of our bodies. Similarly in the tradition of classical music concerts, there is this demand of silence, which opens the door to listening. The sound enters the body. A similar demand of silence occurs in temples as an expression of respect. theatre which provides a safe distance. They couldn't really look at her. I am interested in such intimacy and proximity. On the other hand I also want to imply separation and absence. In many works I am not there. I was there before, returning in intervals of time. There are only traces of something, such as virtual projection, sound or drawn marks. In my recent project with fire and books Phlegethon-Milczenie, there is the time of my presence in the space of sculpture. The viewers bend over my silhouette; they take the books into their hands. All books were published in Germany before the Second World War. There is also the time of the writing of the texts inside the books. The histories of the hands that touched them through years would merge with burnings of books that happened many times in history. Video encapsulates another kind of eternal, circular time and it exists as its own composition. You outline the space. You compose it from open books or mark it by an empty canvas or paper or another material. It becomes a space for your action, just like the chalice, which is also a kind of limited space for you. series these are objects that physically embrace my curled-up silhouette. Intervals is the series of public drawings, which are open for others to enter or open for changes caused by natural forces, like wind, rain or light. The limitation here is more about designating a fragment of time and space. Interval in music signifies distance between two notes, and it implies the separation between two sounds which leads towards a chord. Often your actions require great physical effort. They last for long periods of time, happen in very narrow spaces or significantly lower your body temperature. Time in your art is not really linear, but rather subjective, it’s the time that you live through. When you are immersed in the chalice with water you stop feeling its passage. It is an experience of deprivation? longer actions it has happened to me that the gallery would close and everyone has left, but I was still doing something, curled-up in the fluid. The museum's employees would come to me and tell me that I can stop now. In the project in the space of the city with blue umbrellas, the light gradually disappeared and that was how I knew the day ended. Natural forces appear in your works, such as reacting to light, the motifs of river and fire. These are elemental, basic components of the world, of the matter. Our skin has a lot in common with paper, water and stone. I want to see what happens between these materials, of which we are one, and of which the world is composed. In Limen/Meadow I worked with rolls of clean newsprint paper. I constructed a meadow from a hundred of its layers. Element of water appeared there only as pre-recorded sounds, suggesting an earlier immersion and corresponding with my gradual disappearance under the layers of paper. Idea of immersion appears often in your work and it seems very significant. You immerse yourself in water or in paper. It is a kind of another state, being in a substance. Merleau-Ponty calls the body a space in between, which we have to address. The space of our body is the only and the ultimate reference that we have. Hence there is this symbolic quality in the act of outlining oneself in the world. The act of lying on the ground with my eyes closed becomes a symbolic attempt to overcome an intellectual distance. It belongs to the culture as already post-lingual, and functions as part of unspeakable reality. and Germans are as well, to whom you addressed your project. I burned an edition of Thomas Mann for that project. I filmed how it burned and recorded how it sounded. Higher tone of the burning book was surprisingly different from the sound produced by burning pieces of wood. As you know Thomas Mann was one of the authors whose books were burned by the Nazis. The burning was a difficult and painful experience to me. So the sound is your first impulse and your inspiration? Often the sound precedes other elements, but it is equal with other elements in my works. It functions as sculptural component defining the space. Sound or its lack. Fluxus' members had done actions where they would say “be silent or leave .” I like to define the space through sound environment just like I mark it through placing the canvas or through the action itself. Perhaps we should talk a little about the part of your work, which we couldn’t see here today, which is the installation, the space in which your works are shown and how they are shown. gallery a polypropylene sculpture was placed, with water and an image of my curled-up body projected through the surface of water. Ambient sound of my voice reading was mixed with the sound of water. Charcoal drawings and color prints were hang on the walls. In my other recent exhibition at Remy Toledo Gallery, New York, with Carolee Schneemann, I also worked with two spaces, of which one was very small. Its size suggested to me a cell. I walled-up the window, leaving only a narrow opening, like in medieval monasteries or in war bunkers, through which you could see the Hudson River. The work was called Lethe Room. Lethe, River of Forgetfulness, is a place where we forget our memories. It conveys the unresolved Hamlet’s question. In that room I inhabited a concrete tomb, filled with layers of paper. There are certain similar forms or symbols, which appear in different cultures. Immersion, baptism, opening of one’s arms, which signifies surrender or triumph. I intersected many small-scale drawings among the books in the Phlegethon-Milczenie project. They were made with pencil on pages torn out of pre-war books and notebooks. The books were all open towards the light just like the bodies depicted in the drawings, vulnerable, with their arms up and their hips open, like flowers. I asked a male soprano vocalist to sing a fragment of The Creation by Joseph Haydn, ten times slower then in the original score. Haydn’s victorious scores were altered and mixed with melancholic, lamenting chords of Pergolesi's Salve Regina. In my work I am interested in overcoming of the idea of creativity as aggressive power, towards creativity, which is close to melancholy, surrendering, humbleness, smallness. Agnes Martin, American painter considered as one of the Minimalists, who recently died, said once that she tries to be as small as a grain of sand. itself in your work as a place of eternal repetition and return, through rituals of intellectual cleansing, seasons of the year, natural elements and your relation with natural phenomena. This return to the same activity offers a chance for renewal and rebirth. Also the form of embryo or zygote is evident in your outlining of the body. It is very interesting that through (or despite) the isolation, the self-concentration, you provoke us to enter inside that image. Without any instruction, invitation or forbidding, it happened often that people touched my sculptures; they would bend above the chalice; take the books in their hands and read them. Children have energy, which reminds me fire and water. They are on the threshold of becoming, of individuation. I am separated from them by their otherness. There is a difference between my body and their bodies, which aresmaller and unformulated. In a public space children are more courageous, less inhibited, natural and unpredictable. AS: They are participants whose culture is not constructed yet. There is no choreography. When I open the space of my drawing or image, I don’t know what’s going to happen, if it will happen or not. There is this anticipation of the unknown. Similar to the expectation that happens in the more traditional act of studio drawing, which precedes the mark… I propose in these works an act of lying on the ground. In public space it means that something has happened, perhaps an accident. In my exhibition Five Rivers, which opens at the Lehman College Art Gallery this fall, one of the spaces will become a symbolic river of sound with a male soprano vocalist lying on the ground as he sings. The role of the breathing in performance is very important, especially with regards to how we situate our energy, our body. Everything is performative, in a continuous state of becoming. Although I prefer not to use the word performance, which in English implies an act that begins and ends, which pleases the public. In that sense my practice has more to do with so-called process art. There are compositional lines, which are meant to create a harmony together. These compositions consist of my body also, of presence in general. Our body cannot merge entirely with the world, because we have an anthropocentric viewpoint, which is unavoidable. But at least I am trying. Zofia Kulik talked once about being an abiding psyche-physical instrument. Monika, you talked about performativity as an act of inhabiting the space, which differentiates your actions from the linear performance that you don't want to be associated with. What interests me is the documentation of your actions. You understand what you do as a given action in a given place, which, through your action, becomes performative; then you give a formula to the documentation. These are two different kinds of the notion of time, one of them is this (as Aneta calls it) ritual-spiral time. Observing your work since a long time, I know that your videos are not documentations. You manipulate them, ad commentaries, just like in your project with books. You are a witness of your own self. You are finally able to see yourself from a distance. There is this fluid difference between presence and absence, between disappearance, erasure and the act of leaving a trace, an evidence, of what we are, where we are. Linear representation or being is very important, but only when confronted with the reflection (mirroring), with the reflected and doubled reality. Perhaps traces are more important in my work then the presence itself. I am considering doing an action where the viewer's access will be limited and one will be able to see it only through a narrow Duchamp’s opening in the door. I arrived too late to see the recent exhibition by Marina Abramovic it is in this moment, when she was no longer there, that you were the closest to each other. I noticed that you stopped playing your video tonight in the precise moment when your silhouette was almost, though not entirely, gone from the image. Perhaps that's why I call what I do ‘an image’ The reality becomes two-dimensional, it’s a mapping of the terrain. It’s about leaving one's own body. Leaving, and then looking down at it. After I immerse myself in fluids for long intervals of time, a virtual image of my immersed body is projected back into the vessels. This virtual image looks back at us, at me also. I think that perhaps this is a good moment to end tonight's presentation. I would like to thank everyone for coming to the WYSPA Institute of Art tonight.